In these two examples, we will perform simulations with a frequency-dependent dielectric ε(ω), corresponding to material dispersion. See Materials for more information on how material dispersion is supported. We will compute the broadband reflectance spectrum at normal incidence for a planar interface of vacuum/air and fused quartz. As a validation, we will compare the simulated result with the analytic reflectance computed using the Fresnel equations. This is similar to an example in Tutorial/Basics which involved computing the broadband reflectance spectrum over a range of angles. The wavelength λ is in units of microns. This equation is valid from 0.21 to 6.7 μm. 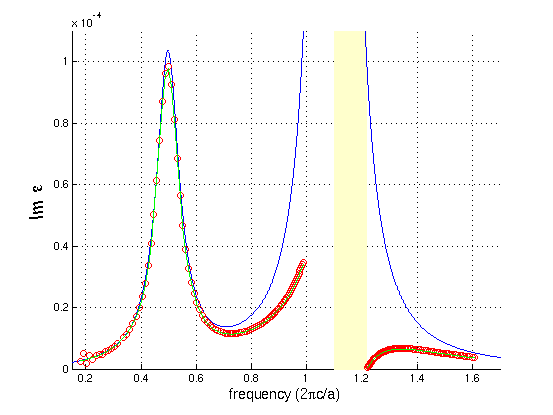 The Sellmeier form for the permittivity of fused quartz can be imported into Meep as a Lorentzian susceptibility via a slight reorganization to convert the wavelength dependence into frequency. This is implemented in the materials library. The simulation involves a 1d cell. A planewave current source with a pulsed profile spanning visible wavelengths of 0.4 to 0.8 μm is normally incident on the fused quartz from air. The reflectance is computed using the convention of two separate runs: (1) an empty cell to obtain the incident power, and (2) with the fused quartz to obtain the reflected power. The details of this type of calculation are described in Tutorial/Basics. The grid resolution, and by direct extension the time resolution via the Courant condition, must be made sufficiently fine to obtain agreement with the analytic results and to ensure numerical stability. Coarse resolutions may lead to field instabilities. The simulation script is in examples/refl-quartz.py. The following Bash shell script runs the two simulations, pipes the output to a file, and extracts the flux data into a separate file. A plot of the reflectance spectrum based on the simulated data and the analytic Fresnel equations is generated using the Python script below. The plot is shown in the accompanying figure. There is agreement between the simulated and analytic results. 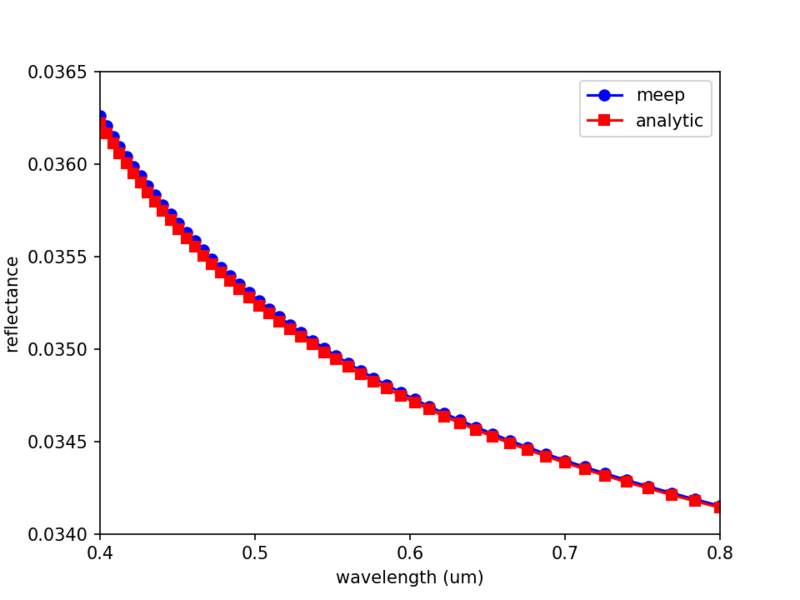 Note that the reflectance spectra is plotted as a function of wavelength, not frequency from which the Meep data is obtained. Thus, the data points are not equally spaced: the spacing is smaller at low wavelengths (high frequencies) than at high wavelengths (low frequencies). We will then compare this with the analytical ε(ω) that we specified. The simulation script is in material-dispersion.py. Since this is a uniform medium, our computational cell can actually be of zero size (i.e. one pixel), where we will use Bloch-periodic boundary conditions to specify the wavevector k.
We can see that the f=1.1 resonance causes a large change in both the real and imaginary parts of ε around that frequency. In fact, there is a range of frequencies from 1.1 to 1.2161 where ε is negative. In this range, no propagating modes exist — it is actually a kind of electromagnetic band gap associated with polariton resonances in a material. For more information on the physics of such materials, see e.g. Chapter 14 of Introduction to Solid State Physics by C. Kittel. On the other hand, the f=0.5 resonance, because the sigma numerator is so small, causes very little change in the real part of ε. Nevertheless, it generates a clear peak in the imaginary part of ε, corresponding to a resonant absorption peak. The red circles are the computed points from Meep, whereas the blue line is the analytical band diagram from the specified ε(ω). 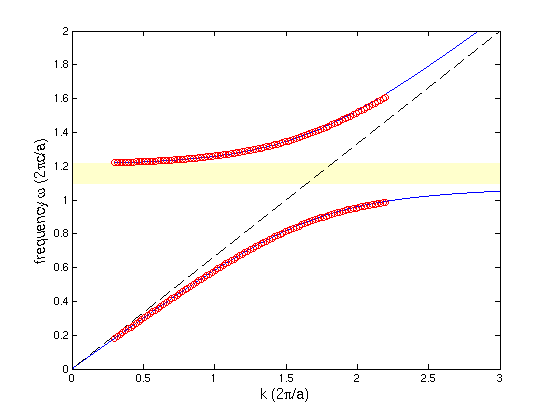 As you can see, we get two bands at each k, separated by a polaritonic gap (shaded yellow). 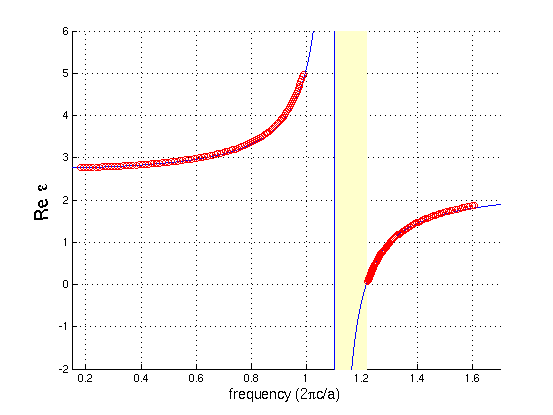 This dispersion relation can be thought of as the interaction (anti-crossing) between the light line of the ambient ε=2.25 material (dashed black line) and the horizontal line corresponding to the phonon resonance. The blue line is the analytical calculation from above and the red circles are the numerical value from Meep — why is the agreement so poor? There is nothing wrong with Meep, and this is not a numerical error. The problem is simply that we are comparing apples and oranges. 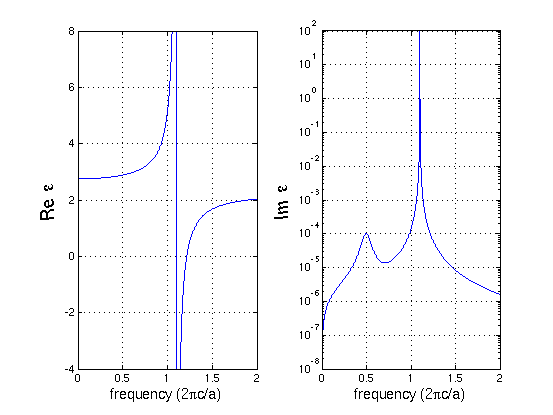 The blue line is the analytical calculation of ε(ω) for a real frequency ω which corresponds to solutions with a complex wavevector k, whereas Meep is computing ε at a complex ω for a real wavevector k. So, the correct comparison is to plug Meep's complex ω into the analytical formula for ε(ω), which results in the green lines on the graph that fall almost on top of the red circles. Why did our comparison of the real part of ε look so good, then? The reason is that ε(ω) at real and complex values of ω are closely related by the analytic properties of ε. In particular, because ε is an analytic function on the real-ω axis, adding a small imaginary part to ω as we are doing here does not change ε by much. The losses are small for all of the computed k points. The change was only significant for the imaginary ε because the imaginary ε was small to begin with.